Sri Lanka has sought expertise from New Zealand in developing the country’s adventure tourism segment and improving high end hospitality training. 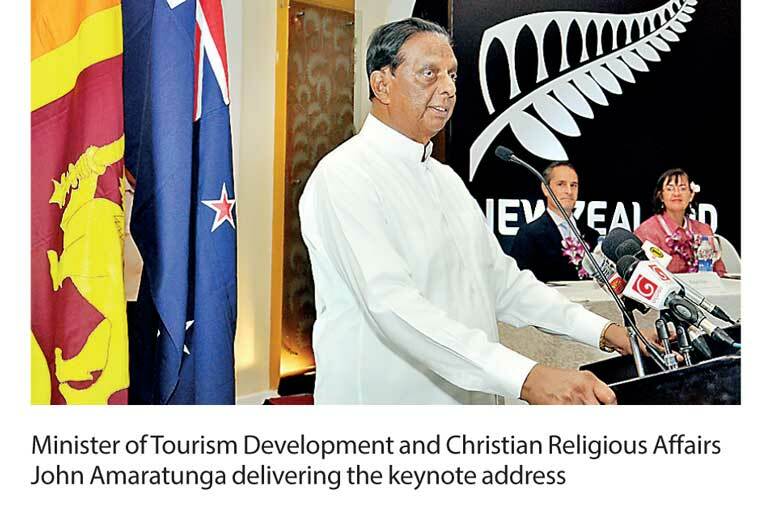 The request for expertise was made by Minister of Tourism Development and Christian Religious Affairs John Amaratunga during his keynote address at the inauguration of the 4th New Zealand Trade Mission Meeting which commenced at the Taj Samudra Hotel in Colombo recently. A group of 20 delegates representing 13 New Zealand companies arrived in Colombo this morning on a three-day visit aimed at forging business and trade links with Sri Lanka. Minister Amaratunga personally welcomed the delegation, the fourth to visit Sri Lanka in as many years, along with Sri Lanka’s Honorary Consul for New Zealand, Senaka Silva. The delegation was led by New Zealand Trade Commissioner for Sri Lanka, Ralph Hays and included High Commissioner for New Zealand in India and Sri Lanka, Joanna Kempkers. “Tourist arrivals from New Zealand grew by nearly 15% last year and we would like to see this robust growth continue in the next few years, especially in the high-end adventure tourism category where New Zealand is a world leader. I believe Sri Lanka has much to learn from New Zealand Tourism and would like to see greater collaboration and also assistance in high end hospitality training and know-how on developing our own tourism assets which are of a similar nature and well suited for adventure tourism,” the Minister observed. Tourism is New Zealand’s number 1 export earner with nearly 190,000 people directly employed by the industry. Over the years New Zealand has developed expertise in food service and food production, environmental management, infrastructure design and development, as well as education and training – areas that have allowed New Zealand’s tourism sector to flourish. “I would like to take this opportunity to encourage tourism, especially in the high-end adventure tourism category. I’m convinced that tourism offers an equitable pathway to ease the trade deficit which is currently very much in favour of New Zealand. Tourism receipts from New Zealand have the potential to ease this lop-sided trade balance. Therefore I earnestly request you to consider tourism promotion as a top priority in your trade agenda. As the same time I request New Zealand companies to invest in Sri Lanka as the fundamentals are now in place for strong economic growth,” the Minister said. 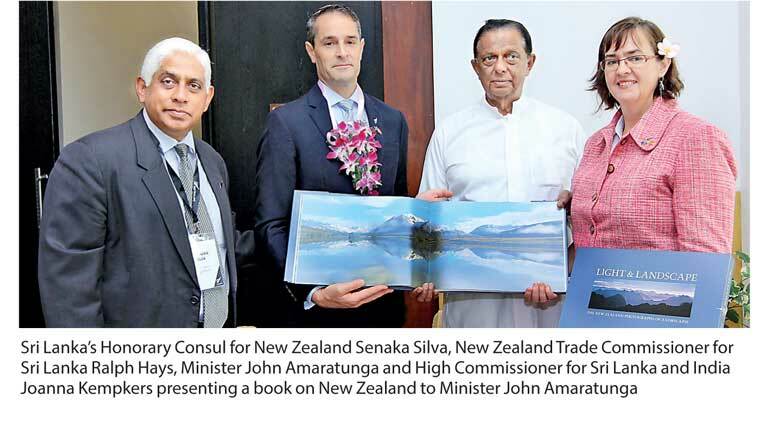 “With Sri Lanka entering in to Free Trade Agreements with countries such as India and Singapore, New Zealand companies have the opportunity of using Sri Lanka as a manufacturing and trading base to access the vast regional market,” Minister Amaratunga added stating that he looked forward to the opening of the New Zealand High Commission in Colombo next year. Two-way trade between New Zealand and Sri Lanka has grown by 31% over the past three years and is now worth NZD367 million (Rs. 41.3 billion). The majority of trade is commodity based but there are increasing opportunities in a variety of sectors including tourism, aviation, agriculture, electronics and education. Speaking during the event New Zealand Trade Commissioner for Sri Lanka, Ralph Hays said, “Like Sri Lanka, we’re proud of our natural environment and want to see it preserved for everyone to enjoy. We feel there are many areas of opportunity such as sustainable tourism development for New Zealand and Sri Lanka to collaborate and to share expertise,” said Hays. Endorsing the views of the Trade Commissioner, High Commissioner Joanna Kempkers stated that outbound tourist traffic from New Zealand was on the increase especially to the Indian sub-continent region and that Sri Lanka should look at attracting a greater volume of this traffic.